Jewelle George, of the St Martin Primary School is Ti Matador 2016. 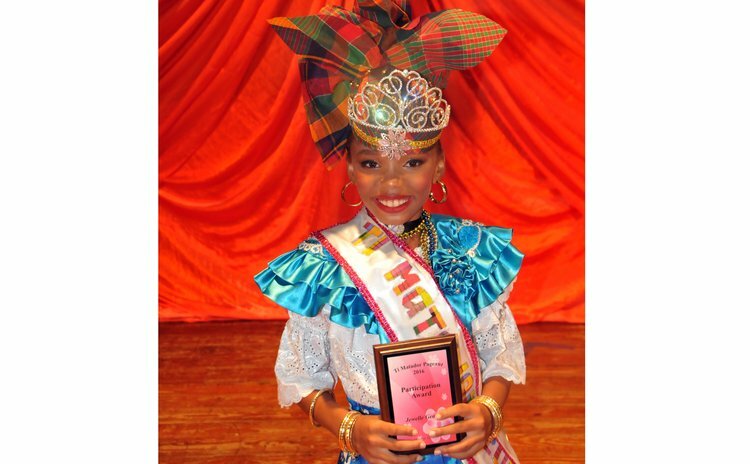 She won the pageant held at the Arawak House of Culture on October 22. Jewelle captured the awards for Best Creole Spectacular Wear, Best Pawol Creole and Best in Jupe. Marci Savarin of the Roosevelt Douglas Primary School was the first runner up; she won the award for Best Performing Arts. The Second Runner Up was Kahanna Blanc of the Grand Bay Primary School. The other contestants were Nixia Matthew of the Goodwill Primary and Kyara Casimir of the Roseau Primary. Paloma Mark , Jewelle George's mother said that she is proud of her daughter's accomplishment. "She knows that we have worked so hard," said Mark. She thanked their sponsor for the pageant, Optipharm Eye Centre and members of Jewelle's school. Mark noted that it took countless hours of rehearsals during the afternoon to prepare for the pageant. The proceeds of the Ti Matador Pageant will go towards providing assistance to Miss Shawnelle Walsh who is seeking medical treatment for Lupus. Walsh is the granddaughter of the 2016 Golden Drum Award Recipient Regina Walsh.